A Beijing safari park where a visitor was killed by one tiger and another was left severely injured by a second has been temporarily closed. Tigers in the Beijing Badaling Safari World in the city's Yanqing district attacked two women who got out of their car while driving through the tiger enclosure on Saturday. One victim was hospitalized with serious injuries, while her fellow passenger was killed by a tiger immediately, Wang Shuqing, a staff member at Yanqing's forestry bureau told the Global Times. The Yanqing publicity department said in a statement that the safari park, located beside the Badaling section of the Great Wall, has been closed and the local government is investigating the incident, The Beijing News reported. A Badaling Safari World staff member confirmed with the Global Times on Monday that the park is awaiting further notice from the government. Surveillance cameras captured the moment when a tiger dragged away the woman who had gotten out of her car. The driver, later confirmed to be the woman's husband, then left the vehicle followed by the woman's mother in a failed attempt to rescue her. The mother was killed by another tiger, while her daughter was left severely injured. The woman's husband hasn't revealed why his wife left the car, according to The Beijing News. There was a child in the car who remained unharmed, said The Beijing News. On Monday afternoon a park staff member denied rumors that the tigers involved have been put down, The Mirror reported. 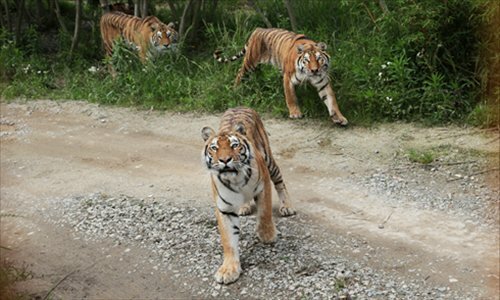 Badaling Safari World, founded in 1998, is located just across the road from the Badaling Great Wall Centre and is home to a large selection of wild animals including tigers, wolves, lions and giraffes. Visitors to the park are allowed to drive their own vehicles through areas filled with the animals, including predators, park staff told the Global Times. "The patrol car had warned her not to get out of the car, but she did anyway," Wang said, adding that every visitor who drives their own car is required to sign a responsibility agreement which stipulates that visitors should keep the car's windows and doors closed, and that feeding the animals or leaving the vehicle is strictly forbidden. If anyone violates the rules they are responsible for what happens, Wang quoted the statement as saying. She also said there are signs and patrol cars which warn visitors to be careful. A Weibo user, surnamed Zhang, told the Global Times that he went to the safari park last winter, and there were warning signs posted everywhere in the tiger enclosure. Also visitors are notified when they are entering or leaving the tiger enclosure. According to the Beijing Youth Daily, at least four people have been killed by the park's tigers and an elephant since 2012. In August 2015, a woman left her car in the tiger enclosure of Hebei Province's Qinghuangdao Wildlife Park and was killed by the cats. "The safari's responsibility can be diminished or even exempted only if it can prove that it fulfilled its responsibility to the victim," Wu Xiangdong, a Shanghai-based lawyer, told the Global Times. "However, the park failed, as it only gave her a warning before the tiger attacked, did not take any effective steps to prevent her from being attacked by the tiger nor expel or isolate the tiger after the attack occurred, which caused another attack," said Wu. Wu added that although visitors sign the liability agreement, it only partially reduces the park's responsibility, as "the safari park can not expect to transfer their responsibility for protecting visitors' safety to the visitors themselves by making them sign the agreement." Liu said the safari park failed to protect the visitors' safety, so it is liable for the accident.